If all goes as planned, Canyon Challenge 3.0 will run very differently from its two predecessors. The annual entrepreneurial competition, sponsored by the Ken Blanchard College of Business at Grand Canyon University, has been fine-tuned to help students get right to the point. 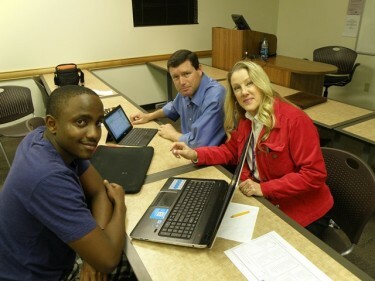 Sophomore Lemmy Gitahi (left) gets some coaching for his executive summary for the Canyon Challenge from Tim Kelley and Lori Soukup, assistant professors in KBCOB. For one thing, the Challenge has been narrowed to for-profit entities, enabling its judges “to compare apples to apples,” according to Assistant Professor Tim Kelley, who founded the competition and continues to oversee it. For another, Kelley is directing students to something called the Business Model Canvas, which identifies nine “building blocks” involved in bringing an idea to full development. The structure, described in text and a short video at www.businessmodelgeneration.com/canvas, should help competitors zero in on specifics. Within its nine categories, the Business Model Canvas poses a total of about two dozen questions designed to flesh out a solid plan. Executive summaries for the Challenge are due on Jan. 31, and 10 finalists will be announced four weeks later. Those 10 will submit full business plans, and then five will be selected to make live presentations — with $10,000 in prize money on the line — on March 27. Dr. Ken Blanchard already has agreed to serve as one of the judges. To help students prepare their executive summaries, Kelley’s IDEA Club (Innovation, Development & Entrepreneurship Association, https://idea.gcu.edu/) has scheduled workshops for 5 p.m. on Jan. 9 and 23 in the Williams Building. In last year’s competition, a majority of the 76 entries were from online students, who will be able to plug into the workshops via video streaming. Kelley, who has a wealth of experience in the entrepreneurial realm, says he’s always looking for two things from a summary: a clearly identified problem and a solution that has undergone at least a measure of testing. “If you don’t get into cost structure or value to the customer, then it’s not a business, it’s still just an idea,” he says. Sophomore Lemmy Gitahi, a student from Kenya, likes what he sees of the new approach to the Challenge. “You identify your business and who you want to attract, and this gives you the best idea for going forward,” says Gitahi, who is working on developing an aerial cinematography venture that will showcase prime real estate for long- and short-term use. The goal, Kelley says, is for the Challenge’s competitors to spend less time spinning their wheels — and for the judges to clearly see how (or if) a model’s engine works. “This tries to cut through the typical academic structure and get to the value that’s being offered (by a business),” he says.